Earlier this semester I was teamed up with two classmates for our first assignment in our video production class and as it turns out, they would be my partners for the rest of the projects we had to do this semester. We all mesh together perfectly and we don’t have to fight for a certain role on each project; it just happened naturally. 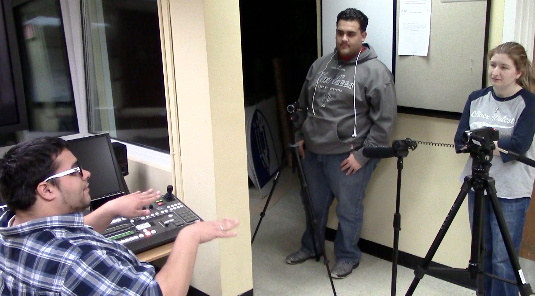 One is the visionary, one is the cameraman, and one is the editor. Of course, we’ve all done our share shooting video, editing and spitting out ideas for each project. It just so happens that we each fell into those “expertise” categories which I feel worked out for the best. Working in groups has never been easy for me. I know some people thrive in group projects, but I’m not one of them. I’ve always been the one who prefers to work alone, not because I’m not a good team player, I just prefer it. However, this has been the first time I have truly enjoyed working in groups for class projects and I have my partners to thank. Both of them have been truly amazing and I would definitely work with them again in future classes or even after we graduate.